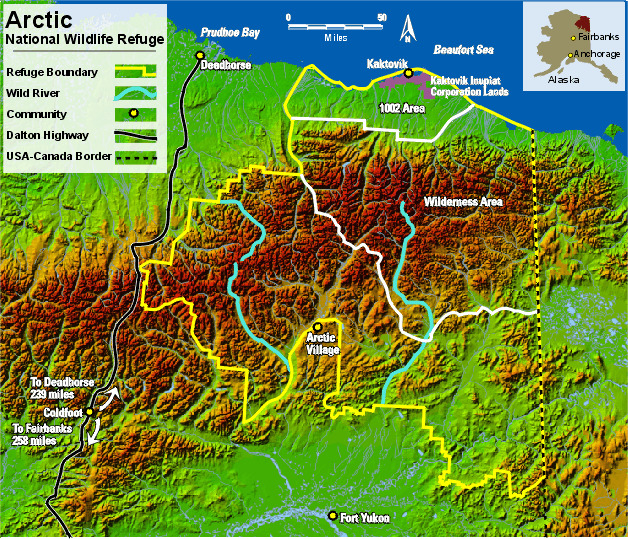 Note: This is the MapCruzin.com archive of the FWS Arctic National Wildlife Refuge website. In December, 2001 FWS took this website offline, making it unavailable to the public. It includes 90 plus pages of information and many maps. As of 2006 the important information contained in this, the original "unsanitized" version of the FWS website, has yet to return to the internet, so we will continue to maintain it here as a permanent archive to help inform activists and concerned citizens. If you find any broken links, please report them to me at [email protected] and I will attempt to make the repairs. January, 2008 update - A small part of the original information that was present in 2001 has made it back into the current ANWR website. There is also an archive that contains a small amount of the original information, but it is not readily available from the main website. Click here to visit our homepage. Click here for NRDC's message about ANWR from Robert Redford. For more information on why this website was "pulled," Check here. And, you can also view the maps of caribou calving areas that the FWS did not want you to see here. Archived by MapCruzin.com. Visit us at mapcruzin.com. MapCruzin.com is an independent firm specializing in the publication of educational and research resources. We created the first U.S. based interactive toxic chemical facility maps on the internet in 1996 and we have been online ever since. Learn more about us and view some of our projects and services.